Where the Moon and Rainbows Meet » Use Exciting in a sentence. Today, for the first time in a while, I went for a morning walk. I’d lost my appetite for a few months, but it’s returning with a vengeance, so I’m gonna start walking and jogging on a regular basis again (or so I say). No more marathons– Been there done that. But I’m like that sometimes. I tend to work really hard to accomplish certain goals or tasks and then move on to something new. 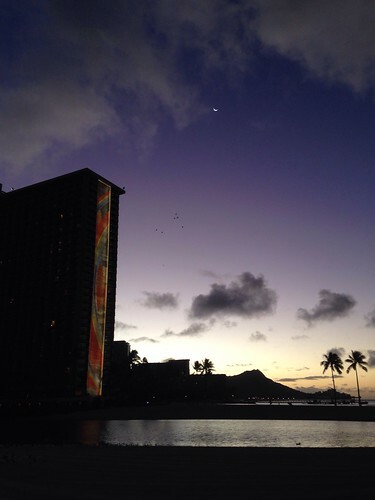 The sun was just rising above Diamond Head as I came around the back of the Ilikai boat harbor and saw the Hilton Rainbow Tower still lit-up. The sky was an amazing mixture of deep purples and blues, with the warmth of the sun seeping upwards from behind Diamond Head. The moon, still visible and bright. I stood there feeling fortuitous and tourist-like– taking iPhone pictures of the whole scene, unable to move on without making sure I was able to somehow capture this moment. I’ve been that way since my first photo class at LCC in the 90s. I use photos to remember things, to document people or places I’ve been. Many things long forgotten are pulled up in an instant when I see a photo from a particular place or period in my life. Some pictures are silent rememberances, others create an instant mood. Once in a while, my brain strains to remember what’s happening or who is in the photo, or whether or not I was intoxicated at the time the photo was taken (either of me, or by me). Today was a good day. I have a picture to prove it.